James Hamish “Jimmy” Watson was a resolute full-back who fell just short of playing 100 games of VFL football for Carlton and Fitzroy between 1921 and 1929. His correct date of birth remains uncertain, but he was at least 24 years of age when he played his first match for the Navy Blues against St Kilda at Princes Park in May, 1921. Recruited locally from Carlton Juniors, Jim wore guernsey number 17 on debut and did well, as Carlton comfortably defeated the Saints by four goals. His next two outings – against Fitzroy in round 4, and South Melbourne in round 5 – both finished in draws. After that, Jim didn’t represent the Blues for more than two years – until round 10, 1923; when he pulled on guernsey number 33, and reclaimed his place in the senior side in a dramatic 1-point win over Fitzroy at Princes Park. Between 1923 and 1926, the Carlton Football Club enjoyed relatively little success, finishing outside of the top four each year. Still, Watson stuck to his task on the last line of defence, and rarely missed a game. It wasn’t until 1927 that the Blues climbed back into finals contention by finishing fourth – only to run head-on into a Richmond combination approaching their peak. The Tigers began a period of dominance over the Blues by snatching victory in the dying seconds of the 1927 first Semi Final – and compounded the disappointment by doing it again in 1928. A record crowd of 66,381 packed into the MCG that afternoon, to see Watson run ragged by Richmond’s star full-forward Jack Titus, who kicked six goals in a 54-point triumph by the Tigers. By circumstance, Jim’s next (and last) game for Carlton was also played against Richmond – at Punt Road in round 2, 1929. This time, the Tigers rotated Titus and their clever half-forward Jack McCormack through full-forward, and between them the pair kicked seven goals in a 10-point win to the home side. It’s hard not to surmise that Watson’s confidence was bruised by those experiences, and easy to understand that Jim would feel that it was time to call it a day. Before he could hang up his boots however, Fitzroy threw him a lifeline and Carlton agreed that he could finish off the year at the Brunswick St. oval. His six games with the Maroons in the latter part of 1929 took his career tally of games to 97. Because he was rarely stationed anywhere else but full-back throughout his career, Watson never kicked a goal at VFL level. Indeed, it is highly probable that he never actually made an attempt. The first Blue to wear number 33 on to the field at senior level, Jim Watson passed away at Mentone on December 28, 1978. 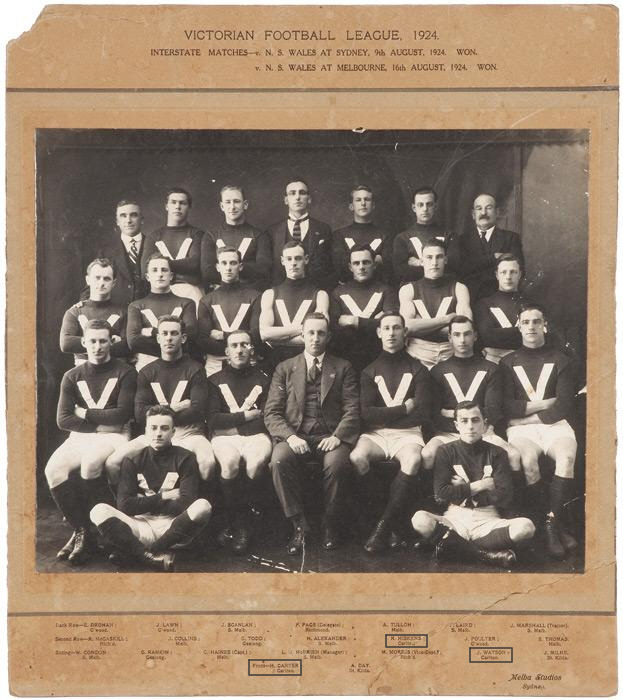 Jim Watson was selected in the 1924 Victorian team that played N.S.W. in Sydney August 09, and in Melbourne August 16. The Vics won both matches. Contributors to this page: pblue , blueycarlton , Bombasheldon , PatsFitztrick , molsey , tmd1 , true_blue24 , Jarusa and admin . Page last modified on Sunday 02 of February, 2014 21:37:52 AEDT by pblue. 1978 - Footy Record Snippet on Andy Lukas name change (02/09/78). 1996 Rd 1 - Parkin Vs Shaw.